Use as trim around mortise locks. 2-/12" diameter. Screw mounted on door. 2-1/4" diameter. Used on old style passage locks. 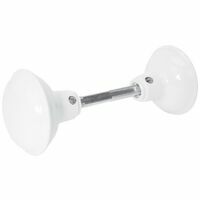 Includes 2 rosettes and installation screws. Replacement spindle for antique style door knob systems and square drive systems. 9/32" diameter square drive, threaded shaft. 3-1/2" length. Includes 2 spindles. Prime-Line Door Knob Set, Suitable For Use With: 1-3/8 in Thickness Doors, 1-3/4 in Projection, 2-1/4 in Diameter, Steel, Brass, Includes: Installation Hardware, For Indoor/Outdoor Applications Heavy-duty diecast housing with brass face and 5 pin tumbler lock. For Kwikset and Weiser locks. 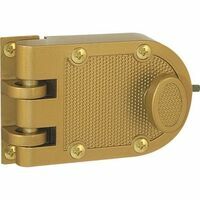 Includes 1 key cylinder with trim ring, 2 keys, 1 mounting plate, and 2 screws. 2" diameter glass knob with brass plated, diecast base. 1-15/16" projection. 9/32" square spindle. 3-13/16" diameter. For 2-3/8" or 2-3/4" backset. 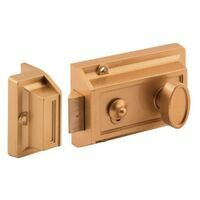 Prime-Line Night Latch and Locking Cylinder, Single Cylinder, 2 Keys, Kwikset Keyway, 2-9/32 in Backset, 5 Pins, Die Cast, Brass, Includes: Night Latch With Locking 5 Pin Rim, Kwikset Rekeyable Cylinder and Trim Ring, (2) Keys, Mounting Plate, Keeper and Installation Screws Rim night latch, surface mount, solid brass latch & hold-open button, brass finish. 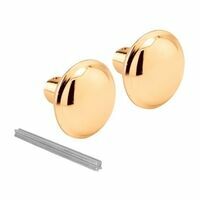 5-Pin, 2 pcs brass material key with nickel-plated finish. KD (key different), Kwikset Keyway, with screws. 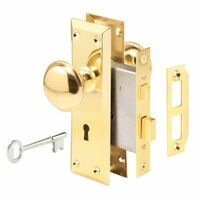 Prime-Line Jimmy-Proof Deadlock, Single Cylinder, Kwikset Keyway, 2-1/2 in Backset, 5 Pins, 4-5/16 in Overall Length, 2-7/8 in Overall Depth, Die Cast, Brass, Includes: Locking Unit With Locking Cylinder and Trim Ring, Mounting Plate, Keeper and Installation Screws Prime-Line Mortise Lock Set, 2 Keys, Skeleton Keyway, 2-3/8 in Backset, 3-7/8 X 15/16 in, 5 Pins, 7 in Overall Length, Steel, Polished Brass, Includes: (2) Knobs, Threaded Spindle, Lock Body, (2) Trim Plates, Strike, Screws and (2) Keys Fluted glass knobs with brass plated steel trim plates. Case-hardened steel housing. Lock bolt is key activated both inside and outside. May be used for left or right hand installations. 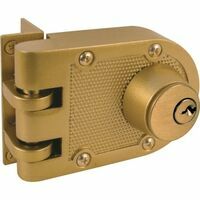 Includes 1 mortise caselock assembly, 2 knobs, 2 trim plates, strike plate, and installation screws.